If you just visiting my Blog...welcome. If you are following the Bitten By The Bug 2 Blog Hop and you arrived from Lori's Blog you are on the right track. If you got lost, the list is below. I chose the ice cream cone cut from the Sweet Treats Cricut cartridge for our challenge this week. It is also Blog Hop week at Bitten By the Bug 2. Please make sure after you are done reading you hop along with us and then play in the challenge and post your project on Bitten By The Bug 2. And follow along and hop to my friend Susan's Blog to see what creation she came up with. She is fabulous! Ice Cream Cone = Sweet Treats @ 5.12". Card Base was 2 cones welded together in Gypsy. Love how you embossed the various layers. This looks delicious! Makes me hungry for some ice cream! So glad to see you posting. I don't want to lose touch of you! Your ice cream cone is fabulous. Love all of the texture in the layers. My favorite flavor is licorice. I love the ice cream cone. My favorite flavor is vanilla. love all the layers and textures. butter pecan is my favorite. tfs. Wow! I love this ice cream cone! It looks good enough to eat =) My favorite flavor of all time has to be cherry vanilla! Maria, you picked the perfect challenge for us this week. Nothing better than a summertime ice cream cone. Love your design. You must love chocolate with those two brown scoops! Maria what a great tripple dipper cone!! YUM! This was such a great challenge for this week - it is sooo hot everwhere right now, who wouldn't love a cone? Love this card! all the layers and twine! My favorite flavor is Chocolate. Beautiful card I love all the embossing. Very cute! My favorite flavor of ice cream is Cake Batter from Cold Stone. YUM-O! This is sooooo cute!! Love the layers!! LOVE your shaped background behind the IC cone, with added twine. My mouth is watering. Beautifuly done! 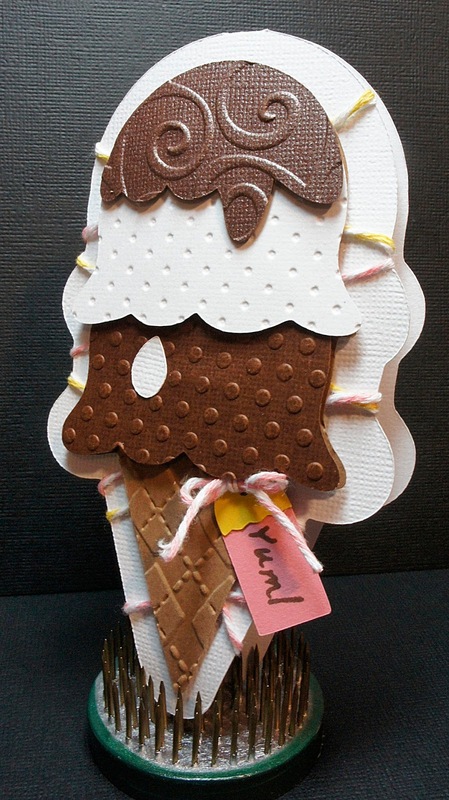 Gorgeous ice cream card! My favorite flavor is Rocky Road! Yum! Oh, this is so pretty! I love how you used a diff. embossing texture for each scoop!! Love this ice cream cone...chocolate and pistachio are my favorite flavors...and your ice cream cone is making me hungry~! Love the embossing! Super cute!! Happy National Hot Fudge Sundae day :)! My favorite icecream is chocolate, love it. Your card is too cute, I'm going to try making one. TFS. We had the same idea! A shaped card and the same embossing folder! ;) This looks super cute, Maria. I'm so glad I was able to play along this week. This is my absolute fave because I am a certified chocoholic!!! 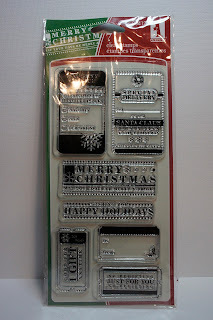 The layering and embossing makes this super sweet!! This ice cream cone looks delicious! I just love the embossing you added!! Ah gimme one of those delicious looking ice cream cones. .... looks so so real, it's fantastic. Fun challenge, Maria, thanks for choosing this cut. Maria - so glad to see you back! We have missed you! Your ice-cream cone is fabulous! I love how you used twine on the backing! My favorite flavor is vanilla. You know the real vanilla with little bits of the vanilla beans in it? That's the one! Να έχετε μια καλή μέρα! your card is so "delicious"!! Ooohhhh wow! Looks so yummy, makes me want an ice cream now! My flavor fave is the good old rocky road! Love that ice cream cone; very real looking. I actually like vanilla bean ice cream. Depending on what brand you buy, it can be so rich and creamy! Thanks for the inspiration!--Pat N.
Hi Maria. I'm just stopping by to say hi. I am one of the new MPS Design Team members and I am so excited to be a part of the team! I'm really looking forward to working with you. By the way...love the ice cream cone. My favorite flavor is coffee ice cream. Cute. I love Ice cream. I would say my favorite flavor is mint chocolate chip. 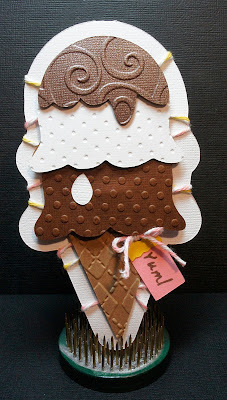 awesome card maria :) all these ice creams are making me crave them so bad :) i actually have 2 favorite flavors of ice cream butter brickle and mint chocolate chip. yum! Maria...i love the challenge you choose. It was tons of fun. Love love love your card. The thread and all the deatil came together perfectly. Lovely card!! love the icecream cone and all the cuttlebugging.. icecream is my favorite dessert. as I always say, "theres alwasys room for icecream!" I love all the texture in this card. The colors are lovely! Great job! Yum. 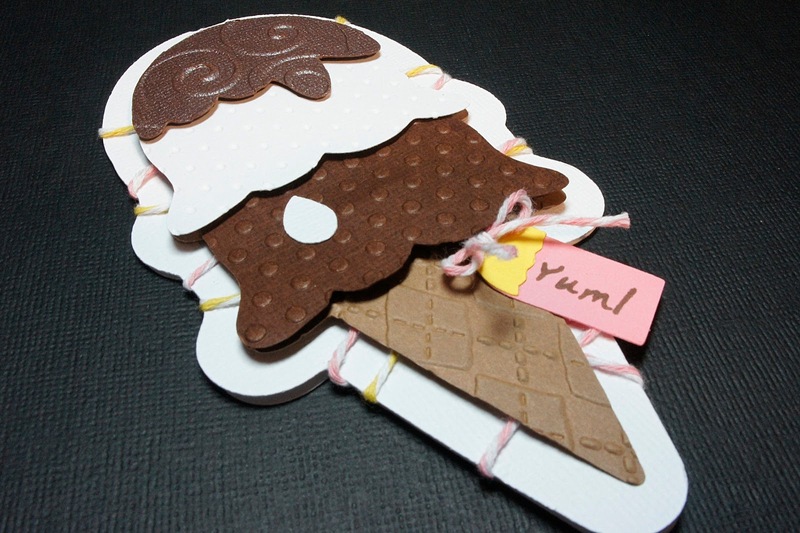 Like the ice cream card. Great blog hop & giveaway. I'm a new follower.